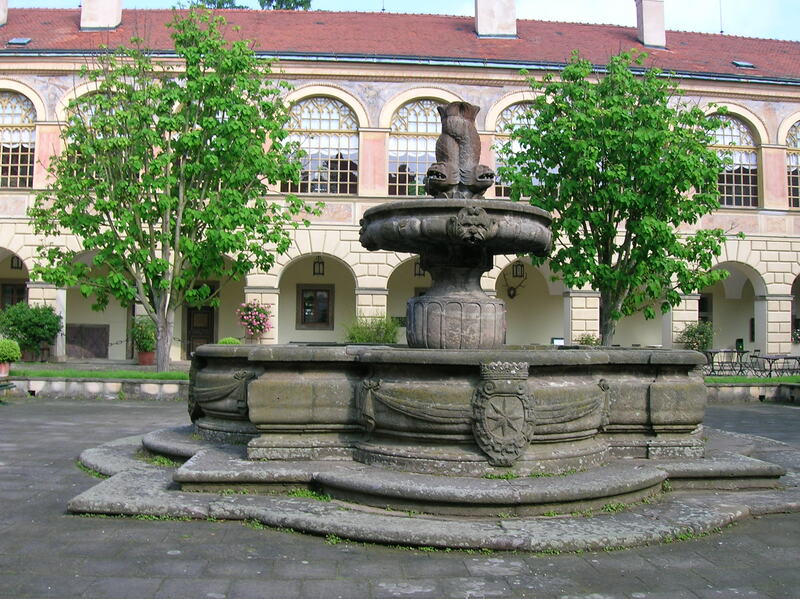 I had visited Častolovice about 10 years earlier, but I did not remember many details of the interior, though I had fond recollections of the picturesque courtyard. For some reason I had fixed in my mind that the chateau was on rather large main square with a pub on one corner, so I expected that the direct bus from Prague would drop me off there. It turned out to be a three-hour trek to Častolovice, located in northeast Bohemia near the Orlické Mountains, via Hradec Králové, but the trip didn’t actually take so long. 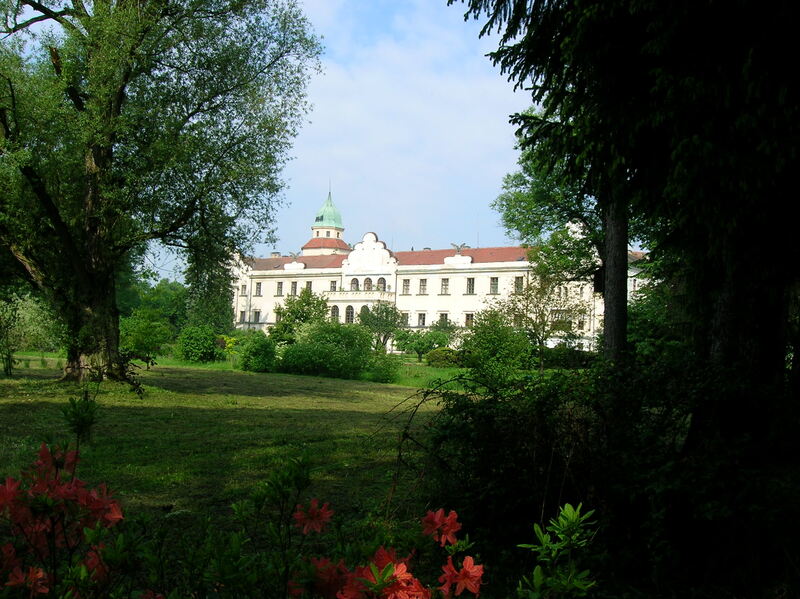 There was a 40-minute layover in Hradec Králové, which is only 30 kilometers away. When the bus arrived in Častolovice, I did not recognize it at all. “This is where I get off?” I asked the elderly woman sitting next to me. She answered affirmatively. I couldn’t believe my eyes. There was no big square with a pub. The main square was hardly a square at all, just a few buildings along the main street with a small parking lot. I got off the bus, feeling utterly lost. Luckily, a passerby pointed out how to get to the chateau. It was hardly more than a stone’s throw away. I walked by a decent-looking restaurant. I wondered if it was the only one in town. I hoped I would be able to get a table there later in the day. I entered the main gate of the chateau, eager to become reacquainted with the place. A Baroque fountain charmed me in the chateau’s courtyard, where birds in an aviary fluttered while singing pleasant melodies. The gentle, soft tones of classical music also filled the air. The atmosphere made me feel at ease on this sunny, warm, spring day. I noticed that the wall of the chateau facing the fountain was covered in what I would later find out were 16th and 17th century frescoes depicting six Roman emperors and a battle. Tourists sat idly at the courtyard’s outdoor café. After going to the box office, where the attendant announced that I would have a private tour at 11:00 o’clock because I was writing about the chateau, I followed an arcade to the 19th century English park that featured a rose garden, pond and small animal farm with an intriguing combination of ostriches, pheasants and pigs. 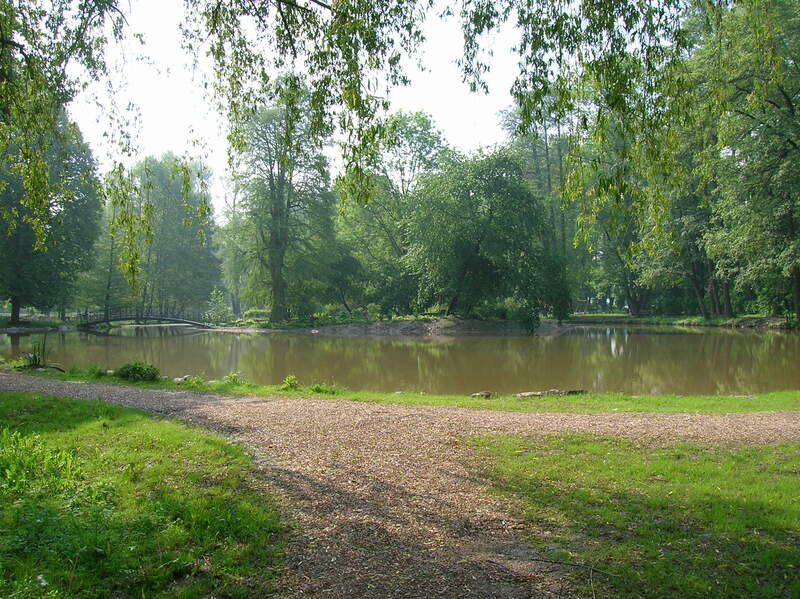 I sat on a bench and read a David Hewson mystery in English for a while, feeling relaxed and enthusiastic, after walking to the pond with gazebo. The flowers in the garden were ravishing, in full bloom, bringing vibrant colors to the natural setting. I still had time to kill, so I went inside the café, as all the outdoor tables were taken. The establishment featured plush couches and armchairs, one of which I sunk into. The pastel colors decorating the space were lively, vibrant. It was also very quaint. I sipped a cappuccino before heading for the box office to start my tour. The guide told me about the chateau’s long history, much of which was dominated by the Sternberg dynasty. While the first written records of what was then a stronghold dated back to 1342, the chateau was transformed into Renaissance style in the 16th century, renovated into a Neo-Gothic style during the 19th century and then changed back to Renaissance style at the beginning of the 20th century. 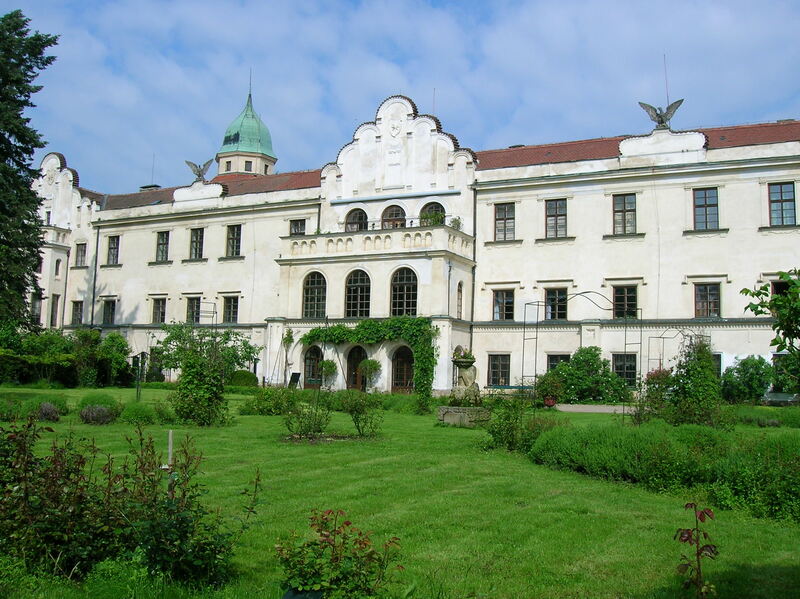 The Sternberg family has owned the chateau for 11 generations, dating back to 1694, when Count Adolph Vratislav Sternberg, the Highest Burgrave in Bohemia, purchased it. 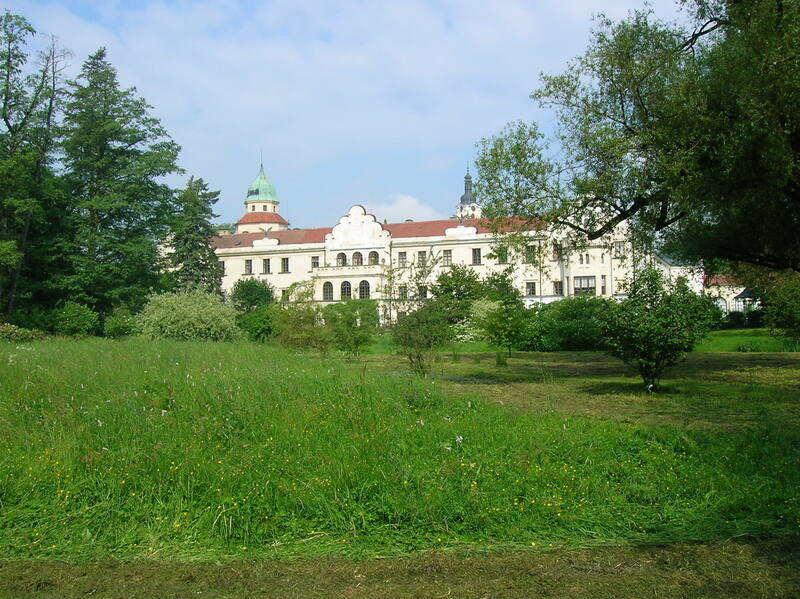 From 1694 to 1948 – not counting the Nazi Occupation of the country – Sternbergs have lived here. During the 15th century, it was Zdeněk of Sternberg who guided the Catholics in their battles with the Hussites and their king, Jiří of Poděbrady (also a former owner of Častolovice). I hadn’t realized what a mark the Sternbergs had made on Czech culture. Franz Josef Sternberg founded the National Gallery and, along with his cousin Casper Maria Sternberg, established the National Museum. The chateau was returned to interior designer Diana Phipps Sternberg in 1992, and at that time she was residing in one wing where she also had a pension. Even during Communism visitors had a chance to see the chateau’s interior as one wing of the chateau was open to the public while the other served as a school for refrigerator repairmen and repairwomen. Soon it was time to see the interior of the Renaissance architectural masterpiece. It featured furnishings from the 16th to the 19th century, and the many family portraits attested to the significant role of the Sternberg dynasty. 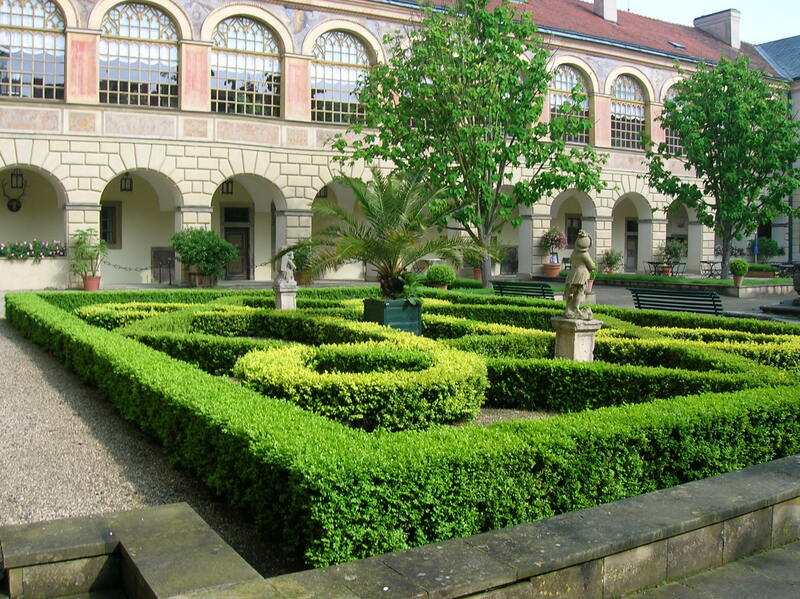 To be sure, the interior was more than impressive: Take the Gallery of the Bohemian Kings, for instance. 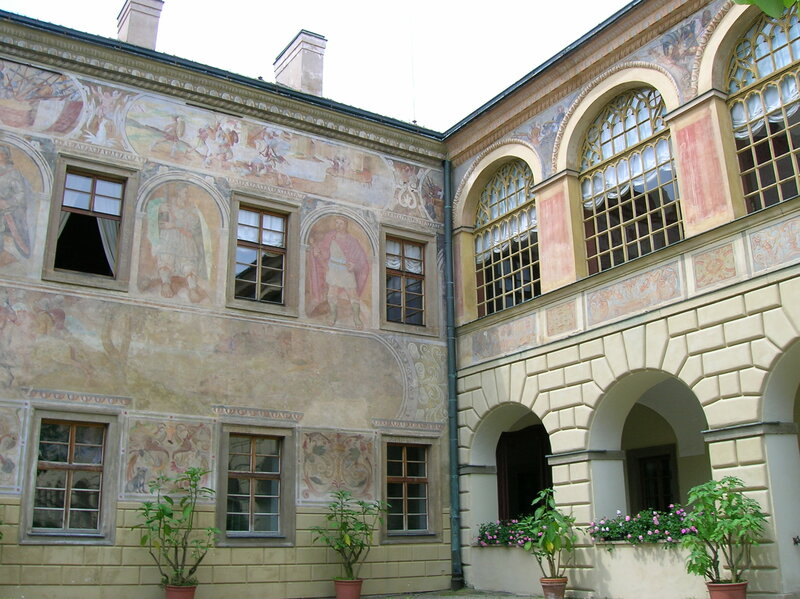 Or the Knight’s Hall, one of the largest of its kind in Bohemia. And I certainly didn’t overlook the small, though exquisite, chapel. In the Dining Room overwhelming, mammoth portraits of four Bohemian kings filled me with awe. I felt so small compared to the vast portraits. These included the black-armor clad Jiří of Poděbrady, who was King of Bohemia, leader of the Christian Hussite movement and owner of the chateau during the 15th and 16th centuries. 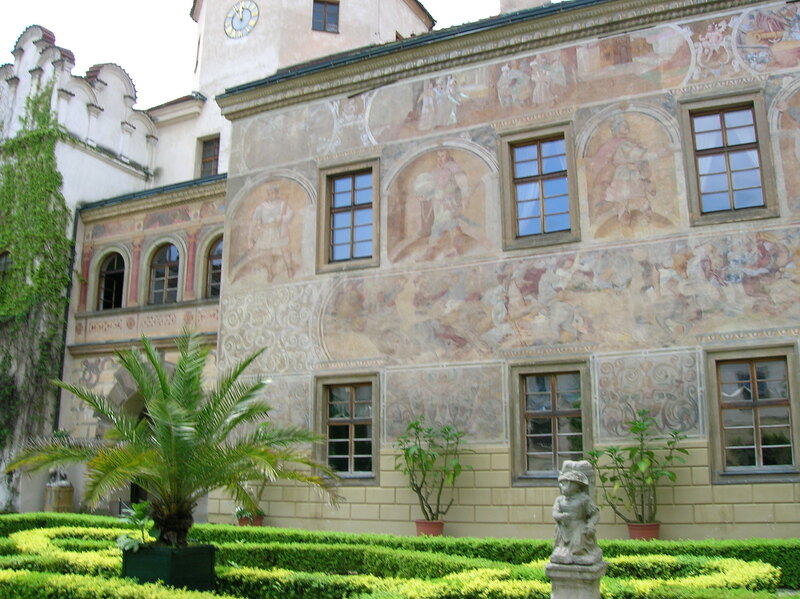 Breathtaking as well were the portraits of seven Habsburg Emperors who ruled from 1526 to 1705. Two portraits of the Spanish side of the Habsburg dynasty plus three others hung nearby. What is more, the painted coffered ceiling, another architectural thrill, illustrated a biblical scene from the Old Testament. The Knight’s Hall was decked with many portraits of Sternbergs, including one of Kateřina Sternberg, also called the Black Lady of Častolovice, because, as a result of an unhappy love affair, she became the chateau’s ghost. I was particularly drawn to her painting. I gazed up at the coffered ceiling, which shows 24 pictures from the Old Testament. I noticed that the marble fireplace had a bronze relief in the middle; it showed a woman praying. Another portrait depicted Emperor Charles V, a Great Dane by his side. In yet another, a woman donning a serious expression and dressed in black stood next to blooming pink roses. I found the juxtaposition of her black attire and the pink roses intriguing. The adjoining chapel was a real gem, too. The painted doors depicted the 12 apostles, and the painted pews were adorned with floral decoration, which immediately caught my eye. The green and yellow tiles on the floor were original, some bearing imprints of dogs’ paws. I thought this was an impressive, unique touch. The wooden altar dated from 1601, and one of the frescoes inside the chapel harkened back to the Late Gothic period. While family portraits were scattered throughout the chateau, there were other intriguing paintings as well. Two noblewomen in shepherds’ attire were the work of Czech Baroque master Karel Škréta or one of his students. Škréta was definitely the artist of the 17th century work, “The Young Huntsman,” who gazed confidently at the viewer. Two small pictures of an elderly woman in the Coat-of-Arms Room were from the Peter Paul Rubens’ School, possibly executed by Jacob Jordaens. A copy of a portrait by Rubens, depicting his second wife, Helen Fourment, hailed from 1640. One painting that drew me into its artistic power was the head of Medusa, with bulging eyes and blue and golden snakes slithering around her head; it was another painting after Rubens. The gem “The Temptation of Anthony” by Flemish artist David Teniers was painted on wood in the Empire Room. One huge portrait shows a red-robed Vilém Slavata, who was thrown out a window of Prague Castle during the Defenestration of Prague in 1618, when Protestant nobleman rebelled against the Catholic hardliners in an event that would in part trigger the Thirty Years’ War. Slavata lived through the ordeal as he landed on a pile of manure, but was then arrested. The ordeal reminded me of the black humor in the stories and novels by Czech legendary writer Bohumil Hrabal. Paintings of Venice, specifically of St. Mark’s Square, the Doges Palace and the Rialto Bridge, decorated the Tower Room and brought to mind my happy days as a tourist in that jewel of an Italian city. Realistic paintings from the Netherlands adorned the chateau, too. I have been fascinated by art from that country ever since taking a course about it in college. In one small portrait, a poor man is eating fish, the bones and head left on the plate he is holding. This work captured the man’s miserable existence – the despair and hopelessness of his life. Another picture from this era depicted a man reading, though he seems lost in thought. The guide pointed out four portraits of women representing the four seasons. Dating from the middle of the 18th century, they included a woman holding grapes for autumn and one holding a flower for spring. If you look closely, the guide explained, it was possible to discern that one woman was the subject of all the portraits, and she aged as each season went by. I was intrigued by these four unique works of art. Numerous other objects of interest cropped up in the chateau. There was a 150-year old Mignon portable folding typewriter and a portable, folding Napoleonic desk in the Empire Room, both of which caught my attention. The Biedermeier Room boasted furniture of that style. I noticed a small statue of Austro-Hungarian Emperor Franz Joseph I and his wife Elizabeth of Austria along with a large portrait of General Leopold M. Sternberg. I was impressed by the many military medals that the general donned. The State Bedroom featured a stirring portrayal of a figure bringing a drink to his guest in the Flemish tapestry “Welcome to Guests” from the end of the 16th century. I loved Flemish tapestries! Two mirrors seemed to be decorated with small gem stones in the frames, but it was just imitation, painted under the glass. In the Ladies Sitting Room, I noticed that Meissen porcelain birds were suspended from the wall. I found it to be a nice, elegant touch to the interior. The Wallpaper Room gets its name from gold-and-black wallpaper that imitated leather, though it was made of paper. In the library, which contains political and religious books as well as novels and poetry written in Latin, English, German, French and Czech, I saw a tapestry showing Cleopatra and Mark Antony. It was Flemish, from around 1600. Another thrill for me! The Renaissance arcaded Gallery, with its vibrant dark pink walls and flourishing plants, featured lavish silver-framed mirrors that dated from the Second Baroque period. I marveled at the elegance of the elaborate silver frames. The Ladies Sitting Room also was home to an intriguing item – a small watercolor, on the back of which is a note of condolence by Empress consort of the Holy Roman Empire and Queen of Bohemia Maria Theresa of Austria on the occasion of the death of Francis Phillip Sternberg’s wife. The Children’s Room also moved me. It was almost all white, with dolls, portraits of children and a dollhouse, exuding a sense of purity. After the breathtaking tour, I walked to the only restaurant in sight and found a table outside. Again I was able to order my favorite – chicken with peaches and cheese – plus a Diet Coke. After a delicious lunch, I made my way to the bus stop to wait 20 minutes. I always arrived early because I was always nervous I would miss my bus. I stood at the small ČSAD sign, watching cars and trucks drive by. Finally, after two o’clock, it was time for the bus to come. And it did. I watched it whiz by the other bus stop, without even slowing down. I was at the wrong stop! I chided myself for being so stupid. I had thought the bus would come to this stop and turn around. I sure felt like an idiot! Then I thought that maybe it was a blessing in disguise. There was another bus in two hours, so I went back to the chateau and sat outside at the café. 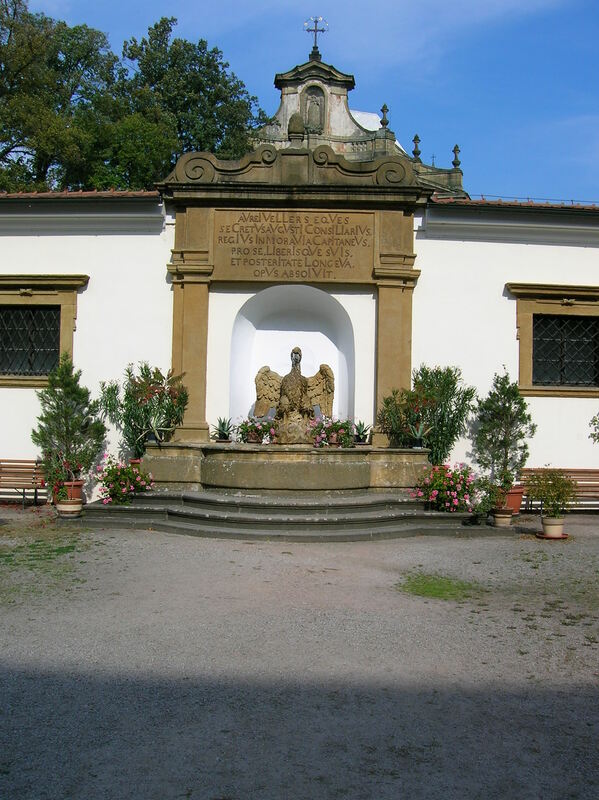 I read about another murder in front of the Baroque fountain. The bus was slated to arrive after four o’clock. So, I got there at 3:30, determined not to miss this bus as it was the last direct one to Prague. Shortly after I arrived, five others with big duffle bags and shopping bags gathered there, too. Then, a little after 3:30, a bus to Prague showed up. Bewildered at the timing of its arrival, I got on and made my way back to Prague. I wondered if it was a bus run by a private company that wasn’t listed on the schedule posted on the Internet. Curiously enough, the bus driver told me that no bus comes through the town after four o’clock. Tracy A. Burns is a writer, editor and proofreader in Prague. My journey started at 6:30 a.m. on a bus from a Metro station on the other side of Prague, about an hour from my home. We arrived in the east Bohemian town of Hradec Králové, where I was to change buses, on time at 7:45. Then I had to wait. But for how long? The information on the Internet stated that the bus to Rychnov nad Kněžnou would leave at 10 a.m., but the woman at the information desk in Hradec Králové confirmed that the time of my next departure was 9:30 a.m. 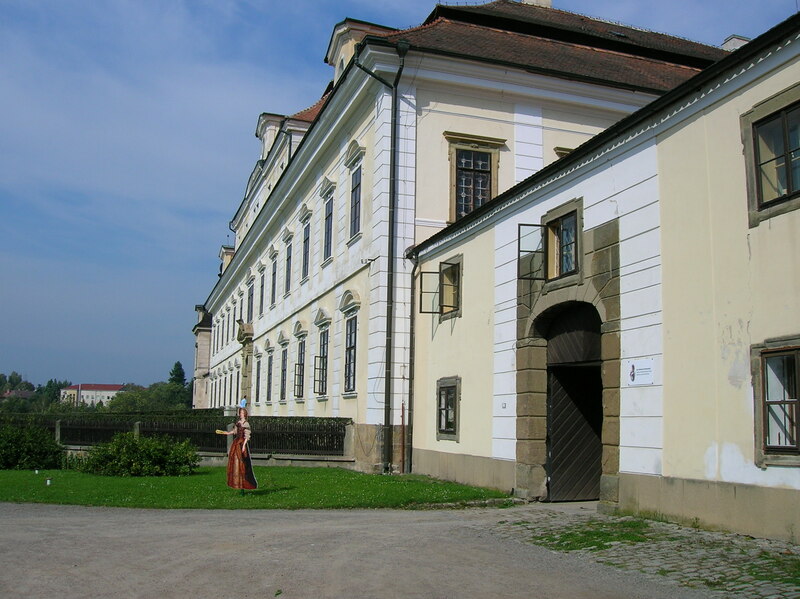 I had already visited Rychnov once, about 10 years earlier. While the chateau may not have outdone those nearby in Častolovice and Opočno, it certainly ranked right up there. The chateau had an intriguing past. The town had been home to a castle or fortress as early as 1258, but it became a ruin, and a church was built over it in the late 16th century. 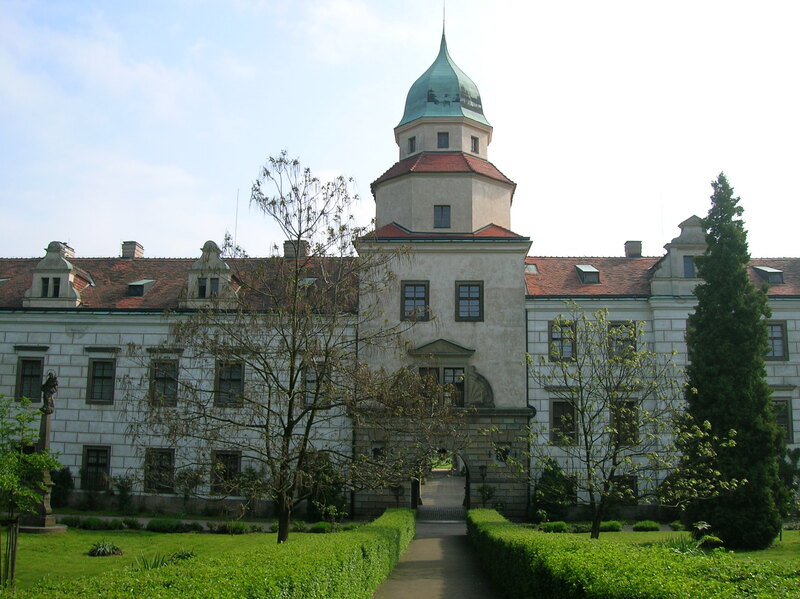 This chateau was built between 1670 and 1690, under the guidance of František Karel Kolowrat. The well-known noble Kolowrat family had purchased the estate during the Thirty Years’ War in 1640, and their descendants even live in the chateau today. (It was returned to the family in 1992.) 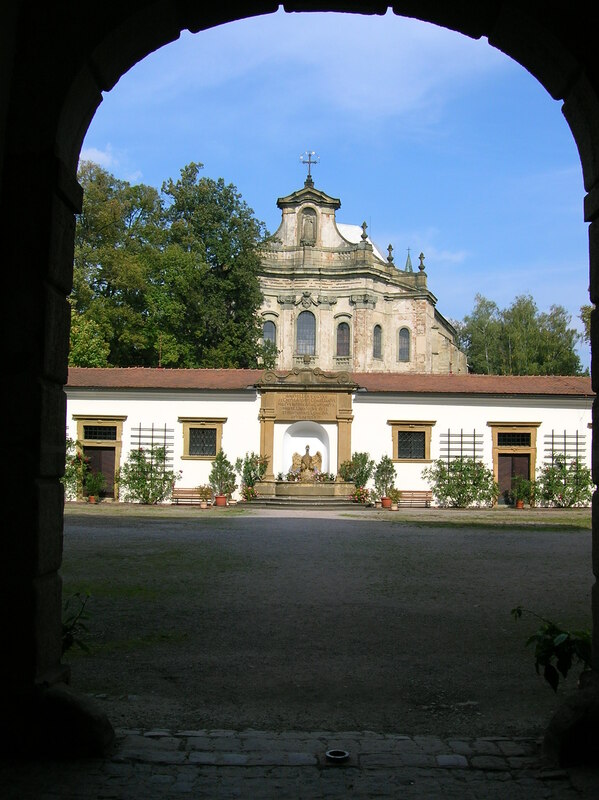 The residence underwent a Baroque transformation between 1713 and 1727. 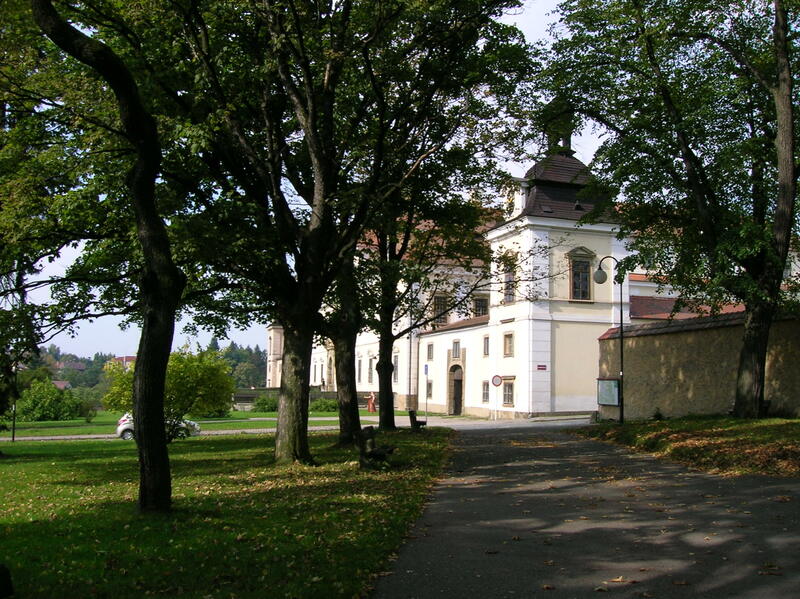 The architect of what was once the riding hall was the well-renowned Gothic Baroque master Jan Blažej Santini Aichel. In the late 16th century a bell tower had been constructed in the town. It was the third biggest in Bohemia, weighing almost seven tons. As I approached the chateau, I noticed the column with the Virgin Mary, dating from 1692 to 1694. Soon I was one of three people on the 60-minute tour. The first thing I saw was the coat-of-arms of an eagle on the hallway floor. Above the red and silver eagle was the word “faithfully;” below it, the word “always.” I paid special attention to the crown above the eagle; Emperor Charles IV gave the Kolowrat family the crown on their coat-of-arms after one member of the family had saved the ruler’s life during an assassination attempt in Pisa, Italy. My favorite room was the picture gallery. The chateau boasted more than 300 paintings on display and furniture from as far back as the 17th century. The picture gallery’s collection of about 400 paintings consisted mostly of portraits of the Kolowrat family members, still lifes and hunting scenes by Dutch and Italian masters, and there were also landscapes. Some works took up religious themes as well. The dark-haired, tall man who was giving the tour mentioned that at one time, the collection held 1,218 paintings. This gallery also traced the development of the nobility in portraiture from the 16th to the 19th century. The biggest delight for me was the masterpiece by legendary Czech artist Karel Škréta – his portrait of Ignác Vitanoský of Vlčkovice. However, not only paintings abounded in the chateau; decorated ceramic stoves were situated in each room, dating from the 17th to 20th century. Other paintings of note included “Esther before Ahasuerus” from the South Netherlandish School of the 16th century. I noticed the luxury of the palace, where the scene took place. In the background, through an open door, I could see greenish-blue mountains and a winding stairway leading up to a mysterious building. What intrigued me the most, though, were the loud, red stockings of Ahasuerus. 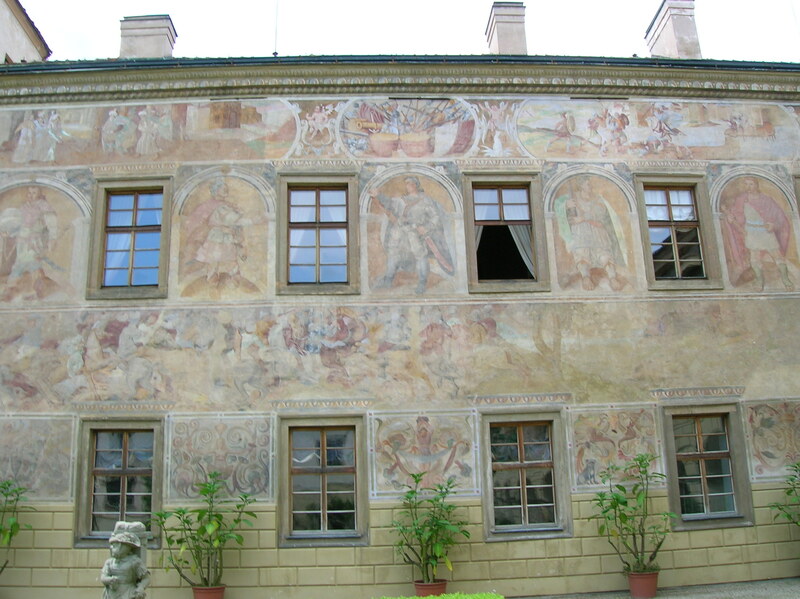 In one room a large painting showed the execution of noblemen on Prague’s Old Town Square during 1621, after the Protestant Bohemian States lost to the Holy Roman Empire, Spain and the Catholic League in the Battle of White Mountain during November of 1620. Edison light bulbs were featured in a chandelier decorating another space. One of my favorite artifacts was a painting of a winter landscape with figures on the ice in a quaint village scene. Several people rode a sleigh, and another was falling down. It reminded me of the wintry creations by my favorite Dutch master, Pieter Brueghel the Elder. The Škréta portrait was certainly a highlight of the tour. Ignác Vitanovský of Vlčkovice had a gentle yet determined look in his eyes as he gazed at the viewer. I also saw Baroque furniture employing a green and tan leaf motif. In one space a pink and white Venetian chandelier greeted me. The guide pointed out that there was an engraving in the middle of one bureau. It showed Boleslav murdering his brother, the future Czech patron saint Václav (Wenceslas), in Stará Boleslav on September 28, 935. Then we came to the Knights’ Hall with life-size portraits of members of the Kolowrat family. The chapel was quaint with its ceiling fresco and altar featuring a very pensive Saint Mary of the Snow. Another room was filled with various fans of different colors, some of them made of silk. The guide explained how fans had been used to set up meetings or ask someone out on a date. For example, a gesture with a fan could tell a man if the woman was single or married. A Buddha also decorated that room. The head and hands could move, and it stuck out its tongue at the viewer. In the Dining Room I saw Viennese, Empire style, Meissen and other styles of porcelain. What interested me the most were the paintings of dead animals on the walls. It seemed to be inappropriate décor for a place where people ate. Looking at those paintings during dinner would certainly ruin my appetite. The tour was over too soon. Then I went to lunch on the main square, where I had my favorite chicken with peaches and cheese. I also checked out the Holy Trinity Church, erected on the site of what was once a castle or fortress. The church was closed, but I did see an intriguing fresco on one wall. There was even more to see at the chateau. The Hladík Gallery featured statues of former Prague professor of the arts Karel Hladík, who lived from 1912 to 1967 and hailed from the Rychnov area. I was impressed. His busts, torsos, decorated totem pole-like sculptures and figures in agony spoke to me as they relayed strong emotions. I felt as if I really knew the people whose busts I saw, as if I almost could understand them. Another intriguing work was his portrait of a gaunt Franz Kafka. The upstairs portion of the Orlická Gallery awaited me. There I saw the landscapes by Jan Trampota. These were landscapes in bright pastels, mostly of scenes in the Orlické Mountains. One of Trampota’s works showed the beautiful countryside with gentle hills and lush trees. The terrain was sprinkled with a few cottages. This watercolor “At the End of Summer” was executed during 1928-29 in soothing pastels and greens and browns, and was my favorite of his paintings on display. In another room landscape paintings by one of my favorite Czech artists, Antonín Hudeček, were hung. 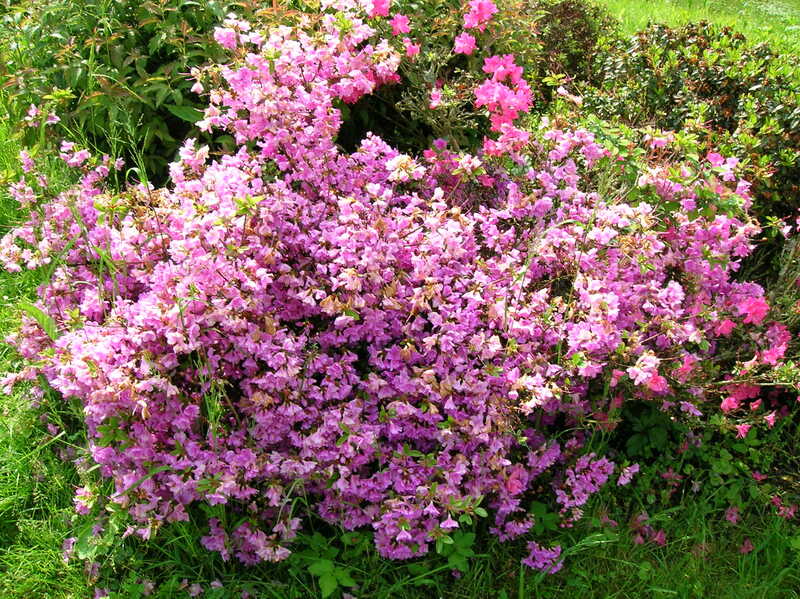 I wanted to take Hudeček’s field of pink flowers home. There were many rooms in the gallery, all boasting intriguing paintings, plus a temporary photography exhibition. By the time I got through the gallery, it was time to hurry back to the station to get the bus back to Hradec Králové. I did get lost during what should have been a five-minute trek, but I still made it in time. On the bus I noticed a sign stating that passengers must fasten their seat belts. But I didn’t have a seat belt. In fact, the other seats near me didn’t, either. Both buses coming to Rychnov nad Kněžnou had been equipped with seat belts. Luckily, there was no accident and upon arriving to Hradec Králové, I immediately got on a 16:30 bus to Prague.